A few weeks ago I attended an NFM Roadshow in Hertfordshire hosted by the Environment Agency. A group of interested participants from the Hertfordshire and North London (HNL) area gathered to hear about the recently published Working with Natural Processes (WwNP) Evidence Database and the 65 case studies which are used to demonstrate the NFM examples. The event aimed to share information on the use of WwNP to achieve multiple benefits for wildlife and people. A number of presentations were given, and I noticed a couple of key themes ‘multiple benefit’ and the use of hydraulic roughness for Natural Flood Management (NFM). After an introduction from Darsha Gill, FCRM Area Flood Risk Manager for HNL, the first presentation was an overview of the WwNP/NFM evidence base, given by Lydia Burgess-Gamble, Environment Agency. Lydia mentioned how the evidence base came about through a review following 2007 flooding, setting out the need for a range of approaches to NFM with the goals of protecting natural function of rivers, coasts and estuaries. She described FCRM as a mosaic of management and interventions, which NFM is an important part of. A catchment scale illustration breaking up the catchment into 3 main sections allowed the NFM approaches to be grouped by land type, demonstrating the potential solutions within a catchment. (1) Creating an Evidence Directory of what we know and the benefits of interventions, involving literature reviews, the creation of the 65 NFM case studies, and 14 1-page summaries describing the suite of benefits including habitat creation, woodland, climate change considerations and water quality. (2) The second step was creating maps of sites where NFM has potential to be effective in a catchment. These open source maps are a tool for working with landowners and Catchment Partnerships to illustrate where NFM techniques could be implemented locally. (3) The third step was to determine the research gaps to revisit and update as we learn more. (1) Background contribution for biodiversity, habitat management and contribution to flood risk. A variety of structures to create slow flow areas across floodplain meadow and improve soil structure. (2) Targeted contribution which involves techniques specifically designed for NFM and Making Space for Water. 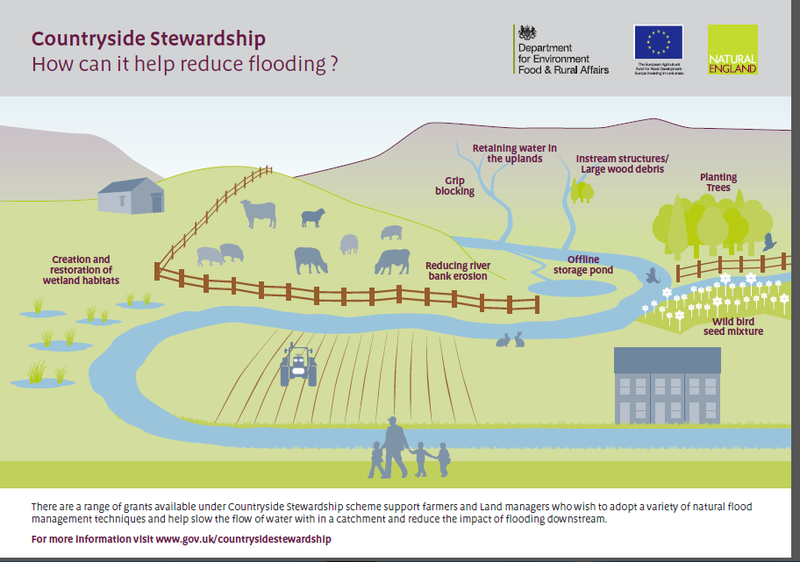 These techniques include river corridor approaches; flood mitigation techniques where making space for water is not possible; and utilising the Countryside Stewardship Schemes to engage with local landowners and use local knowledge. Plus, coupling options can lead to multiple benefit approaches. After lunch there were a series of presentations on local case study examples. Sarah Scott, Chair of the NFM Working Group for HNL presented on NFM in the local area including bespoke riparian planting and cell planting of 20m hexagonal cells to improve hydraulic roughness on the River Roding. Mattie Biddulph and Alex Clark, Environment Agency then presented on two specific case studies. The Shonks Mill Flood Storage Area involved a flood embankment to protect 500 homes. NFM could be used to complement this scheme for extreme, large events, providing multiple benefits. Wet woodland would provide a barrier and interceptor for water, to improve capacity. Large woody debris (LWD), hedges, buffer strips and gate relocation within agricultural land could help reduce runoff. 11 sites were identified using LiDAR, surface water maps, flood maps and surveys with local people. The sites are going to be modelled for flood risk using hydraulic roughness scenarios. The second case study was the Pinn Park Woods were a culvert had exceeded its capacity. The area is to be mapped to identify where watercourses flow in the woodland. 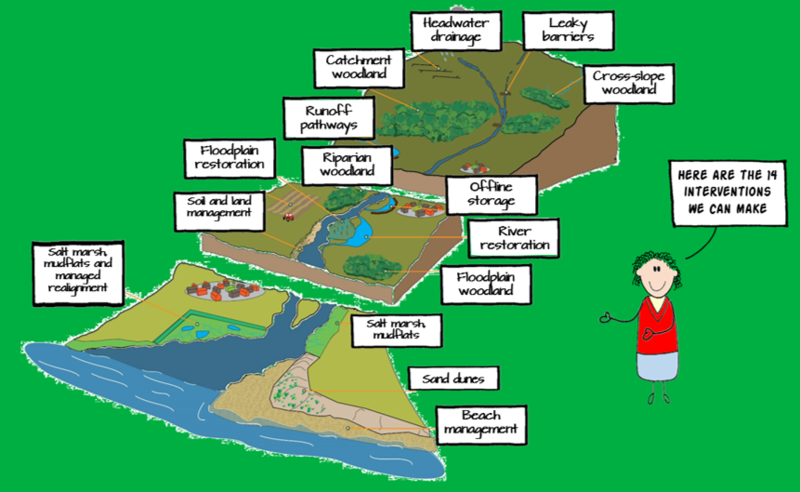 The SSSI site has multiple stakeholders, and a Flood Action Group which helped to study and source pathways. Woody debris dams could help attenuate flood flows over the floodplain. The next local case study was presented by Tom Palmer from Essex County Council. The Kingsmoor Pluvial Flood Alleviation Project in South West Harlow utilised leaky dams, using horses to install the structures, rather than machinery. The materials for the dams were sourced from the local woodland management scheme, and secured in place by hand. This project offered multiple benefits, raising awareness of flood risk, improving ecology and biodiversity, and demonstrating the ease of delivering NFM schemes. It is important to consider the role landowners can play to help a scheme, monitoring of benefits for post-project appraisal, and for maintenance of installed structures. Graham Campbell, Enfield Council then presented the Salmons Brook NFM case study, which utilises similar measures and land management practices to slow the flow and reduce runoff. Wood dams, flow interceptors, ponds and soil management methods will be modelled and monitored by PhD students at Brunel University. John Rumble, Hertfordshire County Council spoke about the projects in Long Marston and Harpenden. Flooding in the area due to a saturated catchment led to consideration of NFM techniques for the next 5-20 years, including upstream flood storage, floodplain connectivity, daylighting, SuDS schemes, drainage clearance and channel naturalisation. The final presentation on local case study examples was from David Johnson, Environment Agency, on the Birchanger Wet Woodland & Community Engagement Project. This 69 acre ancient coppiced woodland presented flood risk to local commercial and industrial properties. The scheme aimed to benefit biodiversity, improve community awareness of flood risk, and reduce flood risk in the area. This project is only in the proposal stage, with options for LWD features to be installed. The cost of the project was kept low through the use of volunteers, and fixed point photography will be used to monitor project results. Lydia Burgess-Gamble closed the workshop with final comments on the presentations throughout the day and thanked all the presenters. Thanks for organising a great roadshow and spreading the word about Working with Natural Processes and NFM. I enjoyed hearing about the more local projects in the area, finding out more about the Evidence Directory, and learning about the potential NFM techniques which are available. 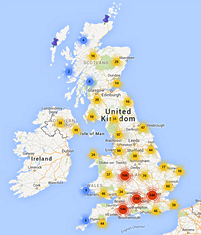 These roadshows have been held nationwide to engage as many interested parties as possible. There are still a few to be held over June, including in Chichester, Leeds, Newcastle and East Anglia. Link to more information on these NFM Roadshows.